President Trump may have signaled that he's grown lukewarm about his Pentagon chief James Mattis, but lawmakers are urging the president not to get rid of him. Any effort to push Mattis out would be "very inappropriate and would not be helpful to national security," Sen. Jack Reed (R.I.) told reporters this week. Reed, the top Democrat on the Senate Armed Services Committee, said he believes other members of Congress would also push back on an effort to oust Mattis. House Armed Service Committee ranking Democrat Adam Smith (Wash.) echoed that sentiment, saying it's "critical" that Mattis be kept in his position. "We'd be better off in national security," he told The Hill. "He seems to have an ability to work with the president while reigning in his worst tendencies." Trump in an interview aired last week on CBS' "60 Minutes" said he believes Mattis is "sort of a Democrat," a comment the Defense chief was forced to push back on. And when it came to the NATO alliance, where Mattis previously served as supreme commander, Trump boasted, "I think I know more about it than [Mattis] does." Trump added that Mattis "is a good guy" and the two get along very well, but added that "he may leave." "I mean, at some point, everybody leaves. Everybody. People leave. That's Washington," Trump said. The Pentagon chief this past week dismissed rumors of his impending departure, telling reporters that the two have "never talked about me leaving" and that Trump told him, "I'm 100 percent with you." The president and his Pentagon chief have differed on a number of issues in the past, including whether to withdraw from the Iran nuclear deal, suspend military exercises in South Korea and ban transgender troops. But Mattis has always managed to hold the president's ear, and has been one of few steady forces throughout Trump's first two years in office. 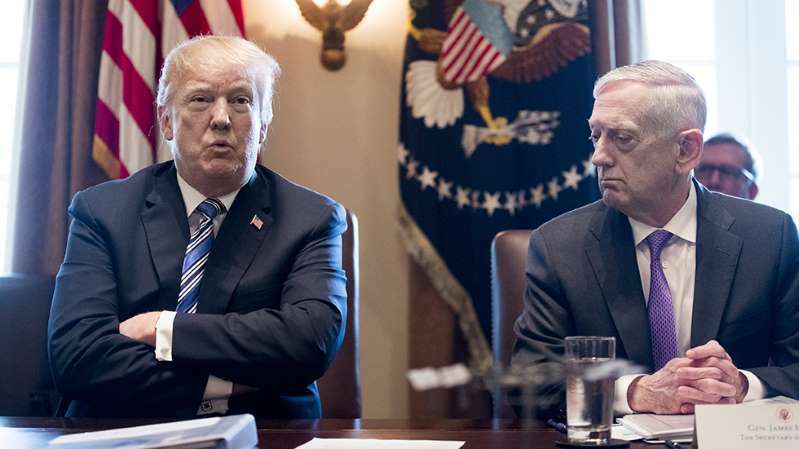 Recent signs from Trump, however, have left numerous Pentagon and administration officials expecting Mattis to leave the Defense Department sometime after the midterm elections next month. Lawmakers from both sides of the aisle are worried that in replacing Mattis, who is widely viewed as having been a moderating influence in the administration, the president may introduce new instability at the highest ranks of his administration. "If he leaves, you inject a whole issue of uncertainty," Reed told reporters this week. "Who's going to succeed him?" Mattis, a leading voice in convincing Trump to not pull troops from Afghanistan and Syria, has so far seemingly kept Trump's most controversial military views in check. The former Marine Corps general reportedly tried to dissuade Trump against the use of controversial torture techniques including waterboarding. Trump in an interview with The New York Times in November 2016 said he was surprised when Mattis said he "never found it to be useful" to waterboard suspects. "I was impressed by that answer," Trump said. A number of top military leaders are already expected to leave next year, and the naming of a new Pentagon chief could add to the unpredictability. Those expected to leave include Joint Chiefs Chairman Gen. Joseph Dunford and Chief of Naval Operations Adm. John Richardson, who are both slated to leave next September. Joint Chiefs Vice Chairman Gen. Paul Selva is set to depart in July, while Army Chief of Staff Gen. Mark Milley is scheduled to leave in August. "At this moment, with the changes that we know are coming in [the Defense Department], continuity is absolutely critical and Sec. Mattis is that continuity," Reed said. "If he is gone and there's another secretary of Defense, you're going to see next year to be kind of like everybody new around the water cooler trying to figure out where the bathroom is. That's not going to be good for national defense," he added. Trump and Mattis's relationship has been at the center of speculation since the release of journalist Bob Woodward's book on the administration in September. The book recounted Mattis explaining to Trump in a meeting that the U.S. keeps a military presence on the Korean peninsula to "prevent World War III." Afterward, Mattis reportedly said the president seemed to have the intelligence of a "a fifth or sixth grader." Woodward also wrote that when Syrian President Bashar al-Assad used chemical weapons against civilians, Trump called Mattis at the Pentagon and said the United States should "f---ing kill" the Syrian leader. According to the book, Mattis hung up the phone and told an aide, "We're not going to do any of that" and instead presented plans for more limited air strikes, a move Trump later authorized. Mattis and Trump have both dismissed the accounts and said it never happened. Still, tensions within the administration seem to remain, with one administration official telling The Hill that there have been disagreements over the level of coordination between the Pentagon and the National Security Council. In April, shortly after taking over as national security adviser, John Bolton tapped Mira Ricardel as his top deputy, bringing on board someone who reportedly butted heads with Mattis when she served as head of Pentagon personnel for the Trump transition team. It was "not a secret that when [Ricardel] was the head of personnel there was some disagreement about who should come in," the official told The Hill. For now, lawmakers are pressing Trump to keep Mattis on board as long as possible. Rep. Mac Thornberry (R-Texas), the chairman of the House Armed Services Committee, said last month he would urge Trump to "keep Sec. Mattis there as long as you possibly can." Smith acknowledged this week that "no one is irreplaceable" and Mattis is "not going to be there forever." "I don't want to imply that we'd enter into some huge national crisis if he were to leave," he said. "But we'd definitely be better off if he were to stay."